Bottom Line: You may need surgery. That’s a line that no one looks forward to crossing. Fortunately, many surgeries are elective which means you may have a choice beyond going under the knife. 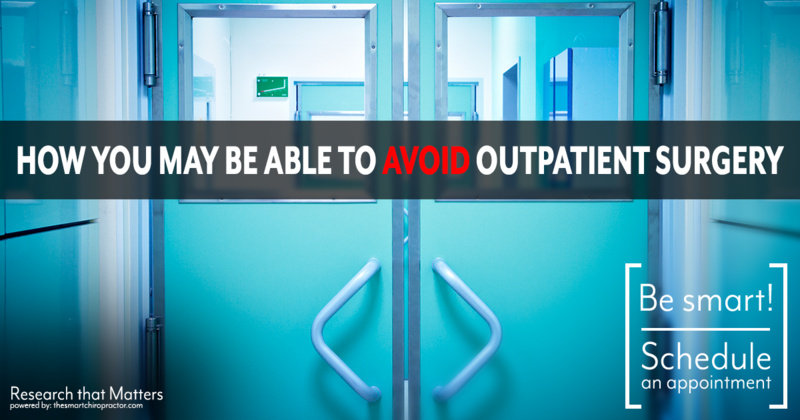 As a matter of fact, a recent study showed people under chiropractic care were able to reduce their chances of having an outpatient surgery or procedure by 62%! Next Steps: If you or a friend has been recommended an outpatient surgery, ask your chiropractor their opinion first! Many large surgery centers have begun to use chiropractors as their first point of contact. This helps patients get the best medical advice from many point of views. It’s always better to stay conservative with your healthcare.